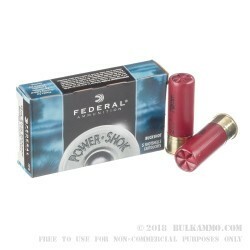 Federal Power Shok is designed to provide shooters with hard-hitting shotgun ammo suitable for hunting and self-defense. 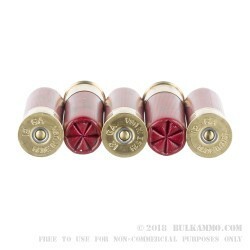 As the name suggests, these Power Shok shotshells hit targets with incredible force and maintain their velocity well beyond the muzzle at 1325 fps. You have many choices when it comes to 00 buckshot, but Federal designs their 12ga ammo with a few innovative features to help it surpass the competition. The 2-3/4 inch polymer shell encases a Triple Plus wad system. 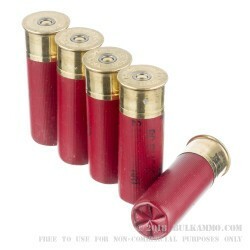 The wad forces the 9 pellets of lead buckshot into uniform patterns for maximum blasting power. 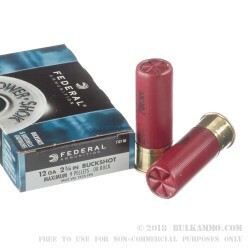 Federal pads the buckshot with polymer buffer that keeps the shot from deforming in flight which increases the penetrating power of this 12ga ammo. Regardless of how you intend to use your 12ga shotgun, if you need 00 buckshot, you can't go wrong with this Federal Power Shok. Order a 5-round box today!